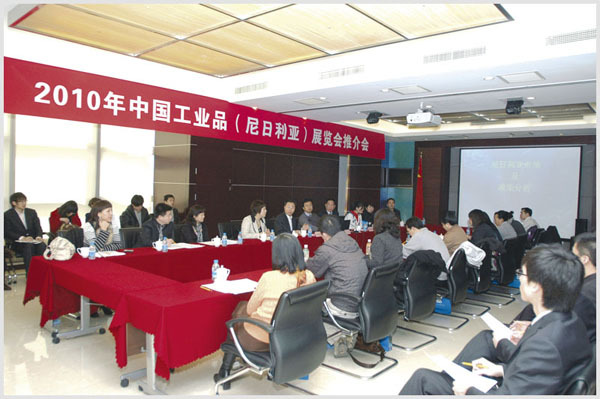 "2010 Made in China Exhibition（Nigeria）"Presentation Seminar was held in Beijing on March 26. More than 50 representatives from Ministry of Commerce, China Council for the Promotion of International Trade (CCPIT), relevant industrial organizations, enterprises and media attended the seminar. Zhang Bin, division chief of the Department of Western Asian and African Affairs of Ministry of Commerce, CNAICO president Liu Jingzhen, vice president Jing Yongjian and managers of related departments of CNAICO were present. Mr.Liu expressed thanks to all the governmental departments, industrial organizations and enterprises concerned for their strong support to CNAICO. He hoped all the parties continue to strengthen communication and adhere to the principle of mutual benefits to realize win-win cooperation and open up new prospects through "2010 made in China Exhibition (Nigeria)". Mr.Zhang made a detailed introduction about the national conditions of Nigeria, including the geographical location, political and economic situation, natural resources, market statistic data and investment environment and so on. Representatives from enterprises discussed with sponsor and organizers on some issues regarding the exhibition, which will be held in November this year.